There are many different reasons why people should invest in gold with at least part of their capital. When the future seems uncertain, not only does the value of gold increase but it can be a hedge against the total collapse of the currency where you live, or other parts of the economy, like real estate as well. However, buying gold bullion can be a little tricky as there are always scammers and thieves trying to separate people from their hard-earned money. Assuming that you have extra money each month that you invest in your retirement, investments, or to protect yourself from catastrophe, then you should put a certain amount into gold. You shouldn’t take food off of your table to purchase it, but it’s a solid hedge against the whole world falling apart. You’ll see a lot of people talking up gold investments as a way to earn money off of the increase in value, and that’s OK, however, at the current value, it can be somewhat risky. When gold cost $40 per ounce you could make a handsome profit if gold went up a few dollars, but when it’s over $1,500 your percentage of profit is minimal even with a good rise. If the global economy takes another serious dive, that’s when gold could become your last savior as the value of the local currency takes a dive. You still have to decide if it’s worth the worry of owning the gold and taking physical possession of it. If the world falls into KAOS, it’s just as likely that the place you have your gold stored will fall into ruin as well. You have to know the seller or risk being a victim, so you should investigate the person or business that you’re buying from extensively before making any purchase. If the seller only has a website, no physical address, no phone number and only email, you’re most likely going to lose your money. A reputable dealer that sells gold coins might be a better way to go if you’re worried about actually having the gold in your possession. Many gold sellers will want you to buy their gold and then pay them to store it for you. This does work, but how do you know that you own the gold? If they go out of business, where do you go to pick up your gold? These are serious questions if you have a large amount invested. How can you trust anyone besides a bank to not sell your gold before they close their doors forever? If you have a bank storing your gold, and the bank goes under, will the government still honor your ownership? And, if there is an economic crisis and the government goes under, that was the reason you bought the gold in the first place, you might be better off with paper money instead. There are a ton of reasons to buy gold bullion, but you have to ask yourself if owning the gold and not having in your possession is any better than not owning it at all. As long as there is doubt in your mind, you should consider keeping the gold hidden on your premises for that rainy day when the reason you own gold happens. There are some gold coins you can buy, and as long as you have them authenticated you should be safe in your purchase. Then, the safest way to store them would be in a safe deposit box where the bank, government, or other people can’t access them. This keeps thieves and robbers from stealing them from you at home, and if the bank or the government go under, they usually won’t have access to the safety deposit boxes, so your gold is still safe. Remember, the biggest reason to buy gold bullion is like the safest investment possible. 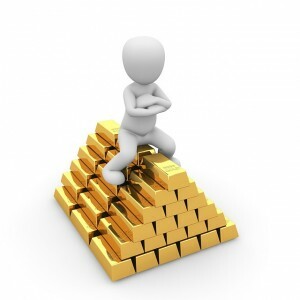 Before you jump into the gold market, it’s a good idea to decide on your real goal. Is it to earn money as an investment or protect yourself from catastrophe? Once you know that, then you know how to handle your gold buying and storing. The mission at Empowr is to empower users by enabling hope, influence and opportunities”. More importantly it allows users to do what they love. Follow Empowr Everywhere. Check out the Empowr Linkedin Profile. It’s a partnership between academia and tech entrepreneurs to deliver a democratized social media experience.